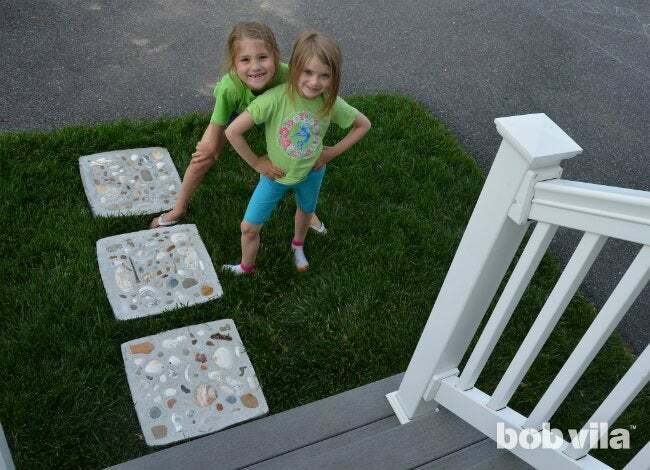 Make and decorate stepping stones with the whole family for a garden accessory that's extra personal. Craft enough of them, and you can build yourself—quite literally—memory lane! 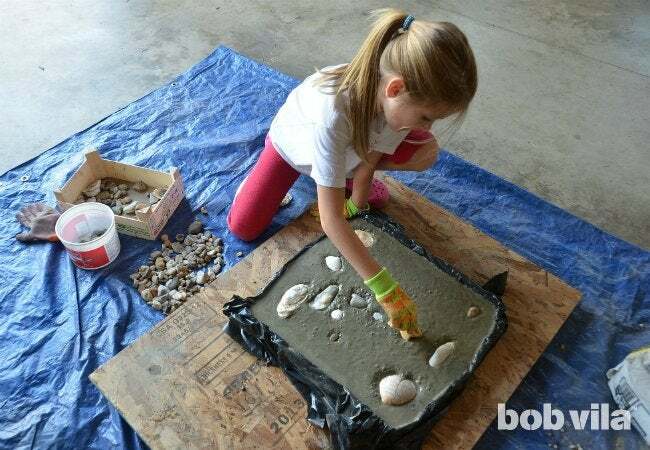 Whether you’re looking for a way to personalize the lawn and garden with mementos from the kids or you’re on the hunt for memorable presents for the grandparents, look no further than a bag of cement mix. Seriously! You probably have most of the other materials on hand at home already to make these stone- and seashell-dappled stepping stones. 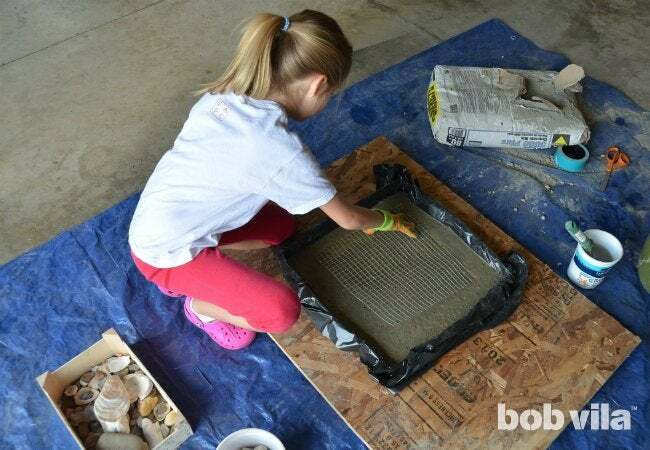 Gather the whole family for this craft: These custom pavers are fun for all ages, and easy enough to make and decorate in a weekend. The more the merrier—and the more stones for your new walkway! This project is good for children of all ages, from toddlers to teenagers. 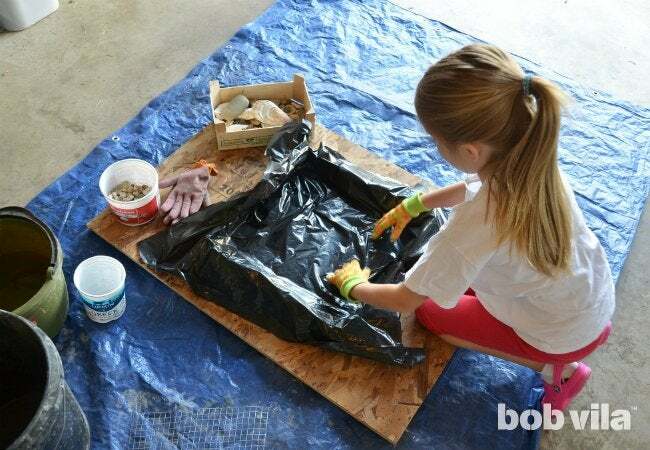 For kids under 3, mix the cement by yourself and let them do the decorating. My 5-year-old was capable of pouring water into the mix and spreading the cement. Kids ages 10 and up can help mix, and may be able to complete the whole project themselves with supervision. Set up shop in a well-ventilated area, and protect the floors with a tarp, drop cloth, or old sheet. 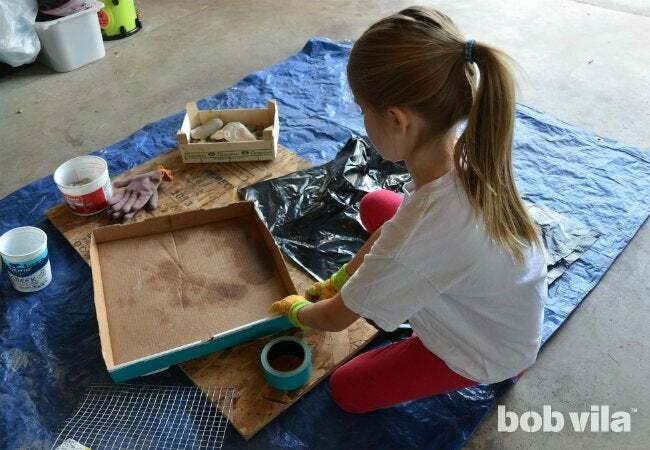 If you have it, lay out a board that’s larger than the pizza box to serve as your work surface—it’ll make lifting the project much simpler later on when the box is filled with cement. Cut the top cover off the pizza box, and restructure the bottom half so that any tabs or flaps folded along the inside of the box move to the outside. When you’re finished, the inside of your mold should be completely smooth. Wrap the sides with duct tape for added support. 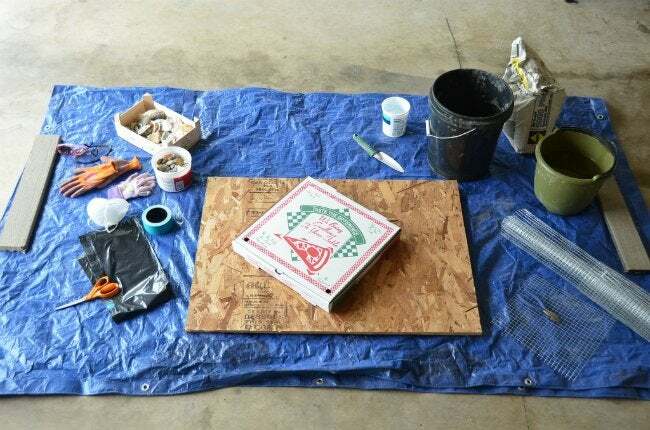 If you’d like to use hardware cloth or chicken wire as a reinforcement, cut a piece of the material an inch or so smaller than your pizza box and set it aside for when it’s time to drop it into the mixed cement. Using wire mesh as reinforcement will help strengthen the stone so that it’s less likely to crack down the road, but it’s not absolutely necessary. Cut a black garbage bag down the sides and open it up. Then, cut it in half to make a liner for your cardboard mold. Lay the liner into the pizza box, and smooth it out across the bottom and up the sides. First, have everybody put on dust masks, eye protection, and gloves. Cement mix is very dusty, and you really don’t want to inhale any of it or get it in your eyes. Then, pour a quarter of an 80-pound bag of quick-setting cement mix into a 5-gallon bucket. Pour in 2 cups of water, and mix with a garden trowel. You’ll want to get the mixture to the consistency of something like banana bread batter: thick, but still easily spreadable. Add more cement mix if the batch is too liquid, or more water if it’s too dry—a little at a time until you reach the right consistency. Once the cement is mixed, pour it into the pizza box until it’s half full, and spread it to the edges. Jiggle the box (via the board, if you used one) to help the mix settle and get the air bubbles out. If you’re using it, place your hardware cloth or chicken wire reinforcement onto the cement and squish it into the mix. Jiggle the box a little more to work out bubbles. Then, mix another batch of cement (exactly as in Step 4) to pour on top and complete the stone. Again, spread it evenly corner to corner, and work the bubbles out by jiggling the box. Now for the fun part! You can remove your dust mask and eye protection, and just leave on the gloves. Lightly press shells, rocks, marbles, or any other embellishments you’d like into the setting cement. Since we live by the beach, we used shells and stones, but the decorative elements can be whatever treasures you’ve collected lately. Let the stepping stone sit undisturbed for at least 24 hours to let it cure. Then, carefully turn the stone over and remove the box from the bottom of the stepping stone. Peel the garbage bag liner off and voilà! It will be hard for the kids to wait, but it’s best to let the stepping stone cure outside the box for another 24 hours before walking on it. 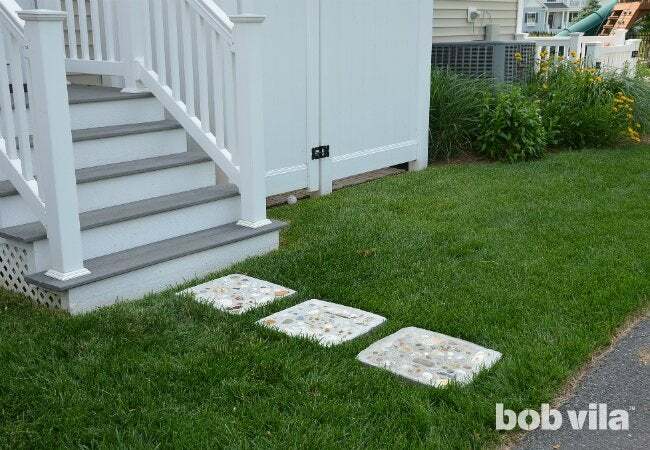 After that, place your stepping stone in your garden or yard where it’s sure to get plenty of use. You’ll have good memories of the fun you had working together every time you set foot on it.